« The Golf Blog: Will 15-year-old Alexis Thompson save the LPGA? The Golf Blog says: OK, boys and girls. Time to get serious. The U.S. Open starts tomorrow morning at 7 a.m. sharp. Our pick: We looked at the stats and studied the list of players in the field. 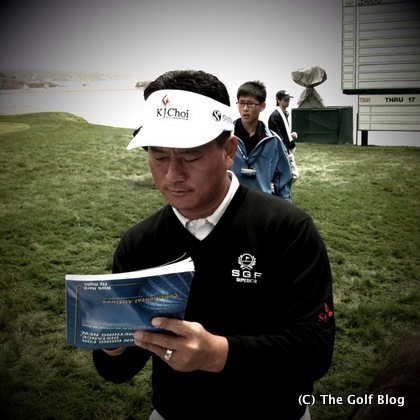 Our pick to win it all this year is KJ Choi. He contended at the Masters on Sunday and looked poised to win it. He’s currently 3rd in scoring and 5th in greens in regulation. Most important of all, he’s 1st in proximity to hole on his shots. Given how small the greens are at Pebble Beach, these stats should put KJ in good stead. We also think he has the toughness and poise to pull out the first U.S. Open for an Asian born player. Dark horse pick: We also have a dark horse. It’s Nick Watney. He’s 1st in greens in regulation and placed 7th at the Masters this year.